PerfectTablePlan scores each seating arrangement on how good it is according to various factors, including: whether guests are seated according to their next to/near to/not next to/not near to proximities, whether guests have empty seats next to them, whether males are sat next to females etc. The total score is shown in the Status bar. When you run the auto seat assignment it tries to find the highest possible scoring seating arrangement using a genetic algorithm. If you don't like the results you can Edit>Undo them. The longer it runs for, the more combinations it can try, and the better your seating arrangement is likely to be. A few seconds is probably enough for 50 guests. But you might want to run it for an hour or more if you have >2000 guests, especially if your computer isn't very fast. You can run the auto seat assignment as often as you like. Each time you run it, it will start with the current plan and try to improve on it. You can stop at any time and the best solution found so far will be displayed. You can colour code guests according to their seating score. Happy guests (e.g. 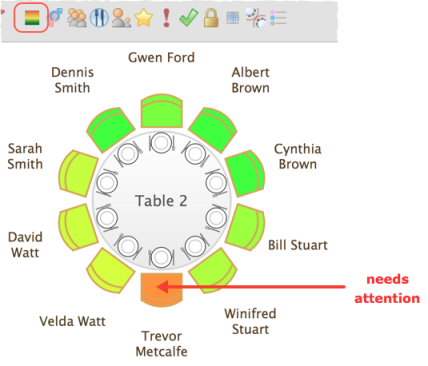 those sat next to guests with 'next to proximity') are shown in green. Unhappy guests are shown in red. No matter how long you run it for, PerfectTablePlan can't guarantee to find the mathematically optimal (highest scoring) solution. This is because the number of combinations for even a small table plan is mind-bogglingly large. However PerfectTablePlan will usually get quite close, fairly quickly. Also the auto seat assign is only as good as the proximities you provide. A combination of auto seat assignment and drag and drop often gives the best results. Lock any guests that you don't wish the auto seat assignment to move next time you run it. You can also select a seat and choose Edit>Guest Suggestions to get a ranked list of guests to place in this seat. The difference that assigning this guest will make to the overall seating score is shown in brackets. Select a guest if you want to place them in the seat (swapping them with any existing guest).